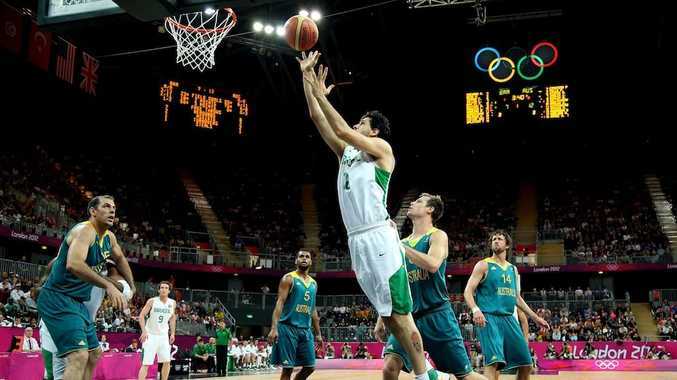 THE Boomers have kicked off their London 2012 campaign with a 75-71 loss against a Brazilian side boasting four NBA regulars in Nene, Anderson Varejao, Tiago Splitter and Leandro Barbosa. With a six team group, the Aussies are looking to finish as high up as possible to avoid a potential clash with gold medal favourites Team USA in the quarter finals and know that a strong start to the competition is essential. The Boomers got off to a quick start skipping out to a 6-2 lead as the pace of Joe Ingles and Patty Mills troubled the Brazilians on the break. The South Americans settled in and claimed their first lead after reeling off 5 straight to go up 7-6 before the Aussie back court went to work with Mills, Ingles and Dellavedova all having four points to their name as they went up 12-7 with four minutes to go in the first quarter. The Aussies continued to play an up tempo game which opened up plenty of space for star Patty Mills to go to work. The Brazilians needed to pick their defensive intensity if they wanted to match it with Mills and the Aussies and they did as they reduced the deficit to a single point with a minute to go before quarter time. Both teams traded free throws, as each team were in the penalty having five fouls each, before a close quarter ended 20-19 with the Boomers holding the slight advantage. Aron Baynes showed his strength down low to bump off his defender and open the scoring in the second quarter for the Boomers as Mills re-entered settling the Aussies adding some more direction to their play. The Brazilians reclaimed the lead for the second time in the game, 25-24, off an Anderson Varejao tip-in before the Brazilian captain Marcelinho Huertas hit a fade away jumper to go up by three and force Aussie coach Brett Brown to have a chat to his troops. It would have been hard for the players to hear anything from the coach as the ground announce decided to get the fans to scream the house down in what was an incredible atmosphere. Tiago Splitter earned a three point play as Aleks Maric racked up his third foul and had to take a seat with the score at 30-24. The play highlighted the strength of the Brazilian side down low where they began to really trouble the Boomers. Baynes continued to have an impact for Australia as he hit another two and saw him claim 8 first half points. Marcelo Machado drained a three to give the Brazilians a six point lead, 35-29, before Mills ignited the crowd with a rare four point play after being fouled after hitting a three of his own, and converting the resulting free throw, to get the Aussies within 2. As the half drew to a close the Aussies worked the clock well, drew the foul and Ingles drained two free throws to see the Aussies trail 36-35 at the end of the first half, with Mills the star with 12 points on 5/12 shooting in 14 minutes to open his second Olympic campaign. The Brazilians rattled off six straight to start the second half culminating in a fast break basket to Nene to have the scores at 42-35. Brett Brown called his charges in to have a chat which got the Aussies going with Mills getting out on the fast break and scoring the two before giving up his third foul, an unsportsman like, leading to the Brazilians to go on another run as the Brazilians opening an 11 point lead, 48-37. Mills again stemmed the flow as he put in a floater to have the Aussies back within nine but couldn't get on a run as he missed consecutive threes. Nene returned to the scorers sheet before Barbosa drove strongly to the basket as he hit a tough lay up to have the lead at 52-39 and the Boomers in trouble as they began to rack up the turnovers. David Anderson then got his team back on track as he scored six straight points himself with a baseline jumper, two free throws and then a fade away from in the key to have the Boomers back within five and back in the game just as it seemed to be getting away from them. Verejao got the Brazilians back on the scoreboard before it was Anderson put in another basket scoring the final eight points of the third quarter for the Australians as the Boomers went into the final break down 56-49. Huertas opened the scoring for the Brazilians in the last quarter before another turnover saw Alex Garcia get out on the fast break, draw the foul and increase the lead again out to double digits, 59-49. Mills then did his best to add energy to the team in green and gold, scampering around the court and working his way to 18 points. The teams went basket for basket as Baynes two was answered by Barbosa before Boomers big man Anderson hit a massive three to have the scores back to 63-56. Two free throws from the Brazilians again had it out to 9 points before Ingles drained a three. The Brazilians again answered but David Anderson was not going to let them skip away having found his range from beyond arc to have the scores at 67-62. An unmarked Varejao drained a midrange jumper before Ingles went high off the glass to again have a five point difference with little over two minutes to go. In what continued to be a back and forth game, Mills Spurs teammate Splitter got a tip in before Aussie captain Matt Nielsen went to the free throw line but could only drain 1 one of his two shots to have the game at a six point margin. After Huertas shot went in and out, Mills ran the floor, drove to the rim and converted on the layup and had the score at 71-67. Barbosa continued to trouble the scorers as he hit two free throws but Ingles kept the Boomers in it with a tough shot 73-69 with 90 seconds to go. Barbosa wound down the clock and then missed a long jumper before Mills also could not connect from downtown. An offensive foul from Barbosa which saw Ingles go down with just under 40 seconds to go gave the Aussies back the ball and Ingles was the one to get the scores back to 73-71 with 29.4 left on the clock. To the crowd's anger the Brazilians again let the clock wind down before Mills almost came away with a steal but instead fouled Barbosa who went to the line with 5.2 seconds to go. He was cool under the pressure to hit both, push his personal total to 16 points and get his team a 75-71 lead. Ingles and Nielsen both missed desparate three point attempts as the Aussies went down by four in their opening match. The Boomers now play world number two Spain on Tuesday.